French President Nicolas Sarkozy has spoken out strongly against the wearing of the burka by Muslim women in France. In a major policy speech, he said the burka - a garment covering women from head to toe - reduced them to servitude and undermined their dignity. 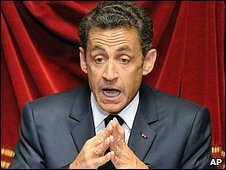 Mr Sarkozy also gave his backing to the establishment of a parliamentary commission to look at whether to ban the wearing of burkas in public. In 2004, France banned the Islamic headscarves in its state schools. "We cannot accept to have in our country women who are prisoners behind netting, cut off from all social life, deprived of identity," Mr Sarkozy told a special session of parliament in Versailles. "That is not the idea that the French republic has of women's dignity. "The burka is not a sign of religion, it is a sign of subservience. It will not be welcome on the territory of the French republic," the French president said. But he stressed that France "must not fight the wrong battle", saying that "the Muslim religion must be respected as much as other religions" in the country. A group of a cross-party lawmakers is already calling for a special inquiry into whether Muslim women who wear the burka is undermining French secularism, the BBC's Emma Jane Kirby in Paris says. The lawmakers also want to examine whether women who wear the veil are doing so voluntarily or are being forced to cover themselves, our correspondent says. Mr Sarkozy's speech was the first a French president has made to parliament since the 19th century - made possible by a constitutional amendment he introduced last year. Later on Monday, Mr Sarkozy was expected to meet the Emir of Qatar, Sheikh Hamad bin Khalifah al-Thani. In 2004, France banned the Islamic headscarf and other conspicuous religious symbols from public schools, triggering heated debate in the country and abroad. Members of the French government have been divided over the issue. The immigration minister, Eric Besson, has said a full ban will only "create tensions" while the junior minister for human rights, Rama Yade, said she would accept a ban if it was aimed at protecting women forced to wear the burka. France's official Muslim council has criticised the debate. "To raise the subject like this, via a parliamentary committee, is a way of stigmatising Islam and the Muslims of France," said Mohammed Moussaoui, head of the French Council for the Muslim Religion. France is home to about five million Muslims.